Should referees wear microphones for the benefit of television audiences? A survey of 2,500 Scottish football fans has found widespread support for greater use of technology in the game. The second annual Clydesdale Bank Premier League Fans Survey interviewed twice as many supporters as last year on a wide range of topics. It found 81.8% of respondents backed the introduction of goal-line technology and 80% supported the use of video replays during matches. 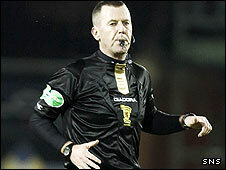 Some 88.3% were in favour of referees wearing a microphone. On the subject of a winter break being reintroduced in the SPL, 60.8% of those questioned were in favour. SPL executive chairman Lex Gold said: "Football is a game of opinions and this survey gives Scottish fans a great chance to voice their views. Are you in favour of more technology in football? "Debate is healthy and helps to develop ideas to move the game in this country forward." On the subject of goal-line technology, Gold added: "I am a great supporter of the concept of goal-line technology and am disappointed that Uefa and Fifa have chosen not to move this forward." Are extra officials the answer?